The recent death of young orca J-50 sent a clear message: It’s more important than ever to dig in and understand what is happening in Puget Sound. It’s urgent. Since 1998, 40 orcas have been born and survived – but another 73 newborn orcas have gone missing or died. These are clearly not good odds. The numbers clearly support the recent formation of the Southern Resident Killer Whale Task Force. While the Task Force considers immediate actions to address the decline of orca populations, science teams are refocusing their work, too. A multitude of drivers affect Puget Sound’s ecosystem. And these drivers have changed over the past 30 years since Ecology began monitoring the seafloor. Warming temperatures, changing river flows, increased ocean acidity, and accumulating toxic substances can affect seafloor sediments and the sea creatures that live within them at the bottom of the food chain. We recently adapted our sediment monitoring program to collect data that will help better understand the effects of climate change and of nutrient pollution flowing into the sound. We took the best aspects of our former work and used it to develop the new program. 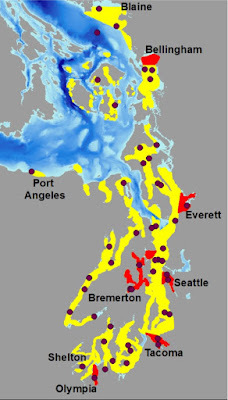 The program consists of 50 sampling stations collected Puget Sound-wide, in addition to 30-36 sampling stations in each of the six largest urban bays. 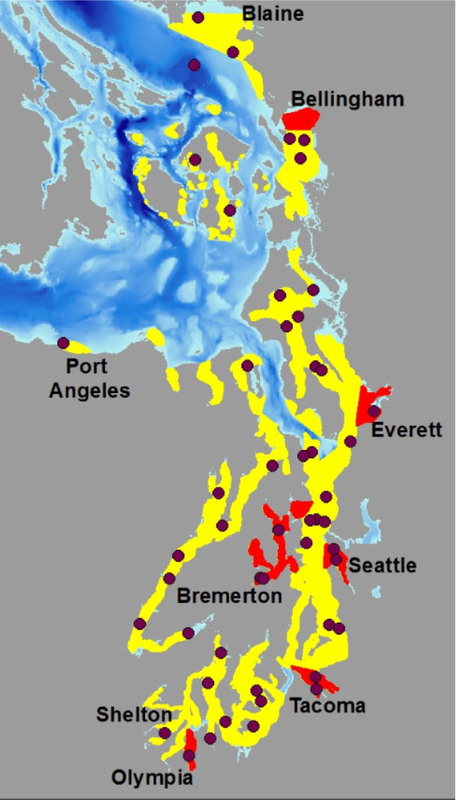 Findings from the new approach will be used to answer questions related to the effects of toxics, nutrients, and climate change pressures on Puget Sound’s sediments and benthos. We’ve been monitoring Puget Sound seafloor sediments and the invertebrates (benthos) that live within them since 1989. We’ve gathered more than 1.5 million invertebrates and 3,000 sediment samples. We track the numbers and types of species we see in order to understand the health of Puget Sound and detect changes over time. The extensive collection supports researchers, state agencies, and local governments. The most publicized results of our data are the Vital Sign Indicators for Puget Sound. These high-level environmental indicators are used by the Puget Sound Partnership, a state agency that leads the region’s collective effort to restore and protect Puget Sound. We partner with many researchers to leverage our sampling efforts to learn about other impacts to Puget Sound. For example, we collect sediment for University of Washington researchers who study foraminifera, small, shelled organisms that live in sediments. Changes in communities of these organisms over time may be indicative of effects from ocean acidification in Puget Sound. UW scientists also examine our samples for microplastics that end up in the sediments, while another group studies a species of algal cysts in sediments that can cause harmful algal blooms. The seafloor might not be the first thing the average person thinks about when considering the health of Puget Sound. 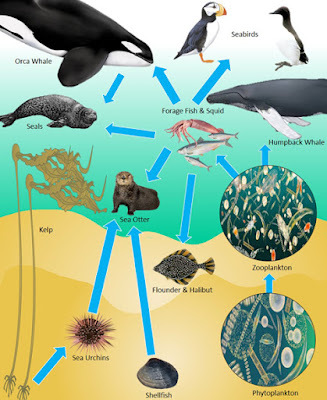 But to understand what is happening at the top of the food chain, scientists and researchers need to understand what is happening throughout the entire system, beginning with the bottom. The sediments of the seafloor. Organisms that spend most of their lives in the sediments are easy to collect and are reliable indicators of sediment and water quality. creatures at the bottom of Puget Sound. Passing on knowledge is an important part of our work. Over the years the large collection of preserved invertebrates and many specimens have been loaned to the South Sound Estuarium where they are used to educate the public. To reach younger generations, our sediment monitoring specialists have worked with undergraduate and graduate students in regional colleges, and they participate in community outreach events, including the South Puget Sound Community College’s science, technology, engineering and math (STEM) camp for middle-school girls. Today, we need to collect data about the quality of all elements of the Puget Sound ecosystem that can inform groups like the Southern Resident Killer Whale Task Force and decision-makers who are working to rehabilitate Puget Sound. Visit our website to learn more about work related to Puget Sound.